The 2017 ProHOME is a part of an eight-house development of affordable, net-zero homes. 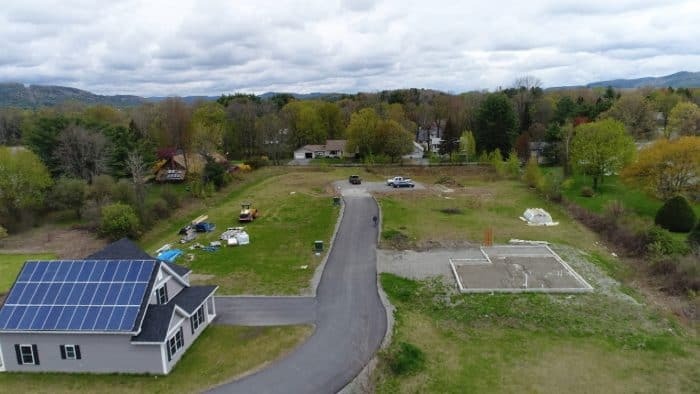 In 2015, we set out to build the first ever net-zero community of homes in Vermont that could be priced as close to the surrounding existing market as possible. A local site contractor owned a 2.5 acre parcel of land which he had previously permitted for an eight-unit single family housing development, but aside from roughing in the road, sewer, and water just before the recession in 2008, no more work had been completed. Not ones to be deterred by something like a nationwide recession, we struck up a deal and purchased the property from him. Since our main goal for the project was to build net-zero homes, our first order of business was adjusting the site plan to allow each of the homes to maximize their southern exposure. All this required was to shift the footprints of the homes ten to fifteen degrees to the east or west (depending on the location) and resubmitting the plan to the town for approval. We decided to use the same foundation footprint identified in the previously approved development plan to speed up the approval process. If we had not, extensive engineering would have had to been completed to meet water drainage requirements. As it was, even with the minor changes we asked for it still took six months before we had approval. Our second order of business was to design energy efficient home options with some curb appeal that fit on the previously approved foundation footprint — not a simple task. Key features we wanted to incorporate included 12-in.-thick exterior walls, a roof design that allowed for 20-in. of dense-pack cellulose insulation, a main south-facing roof for solar, single-floor living with a second floor option, and a garage if possible. I happy to say that we accomplished these goals, though the desire for more living space on the first floor resulted in room for only a one-car garage. The requirement to work within the existing footprint posed a few challenges for building an airtight home while maximizing living space and curb appeal. The easiest approach to constructing air-tight buildings is a simple exterior envelope. The more complex the design, the more difficult it becomes to insulate and air seal. The ProHOME falls somewhere in the middle of simple and complex. I’ll expound on the various challenges in the envelope framing as they pertain to energy efficiency as we progress through the build. The ProHOME will be the second home built in the development. The first home, built exactly as the ProHOME plan, received a Home Energy Rating System (HERS) index of -4. (NET ZERO!) It’s great to know that we were able to achieve our goal of net-zero on the first home while working within pre-established parameters, AND it gives a great goal to shoot for on this home!